Mahindra has launched its new Gusto 125 in certain parts of the country excluding Delhi as the National Green Tribunal has pushed an order than only BS IV complaint two-wheelers and three wheelers can be sold in the region. Nevertheless, Mahindra has launched the Gusto 125 in Bangalore with a sticker price of Rs. 50,680 for the DX version while the higher spec VX model retails at Rs. 53,680. 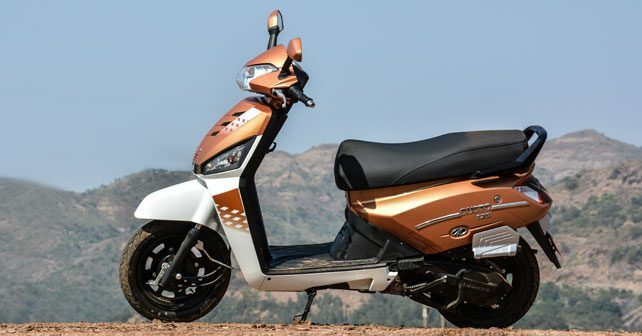 As of now, the Gusto 125 is only available in Karnataka and Tamil Nadu, Mahindra plans a phased launch of the scooter across the country. The Mahindra Gusto scooter was launched around a year ago and the introduction of the 125cc model will definitely allow it to cater to a wider market base. The Mahindra Gusto 125 is powered by a four stroke, air cooled, single cylinder, M-TEC 125cc petrol engine developing 8.5bhp @7,000 rpm and 10Nm of torque @ 5,500 rpm and is expected to have a fuel efficiency figure of 45 – 50 km/l. The scooter rides on 12 inch wheels shod with tubeless tyres. It has a ground clearance of 165mm. The Gusto 125 looks a lot like its 110cc sibling, setting it apart is a new front apron, dual tone colour theme and a chrome heat shield for its exhaust. Like the 110cc model, the new Mahindra Gusto 125 too is a well equipped scooter with the VX model boasting of features such as a height adjustable seat, multi function remote flip key, etc.